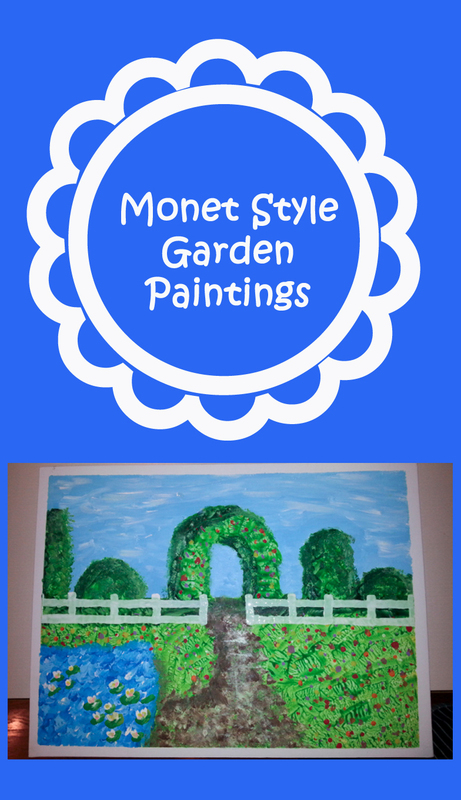 During our six weeks of great artists this year, we studied impressionism and specifically talked about Monet. I found a fantastic tutorial on Mr. Picasso’s Art Room and used it to create masterpieces and memories. First let me tell you that I am NOT an artsy person. I’ve told the story before of how I went into Michael’s and purchased $100s of dollars of canvases, paints, and paintbrushes thinking I would be the next Michelangelo with all those supplies. Ha! Let’s just say all that crap my art supplies have never been used. Until now. Mr. Picasso must be some kind of genius in the way “he” structures things, because even I figured out how to create art using his tutorial. Here are our finished products. 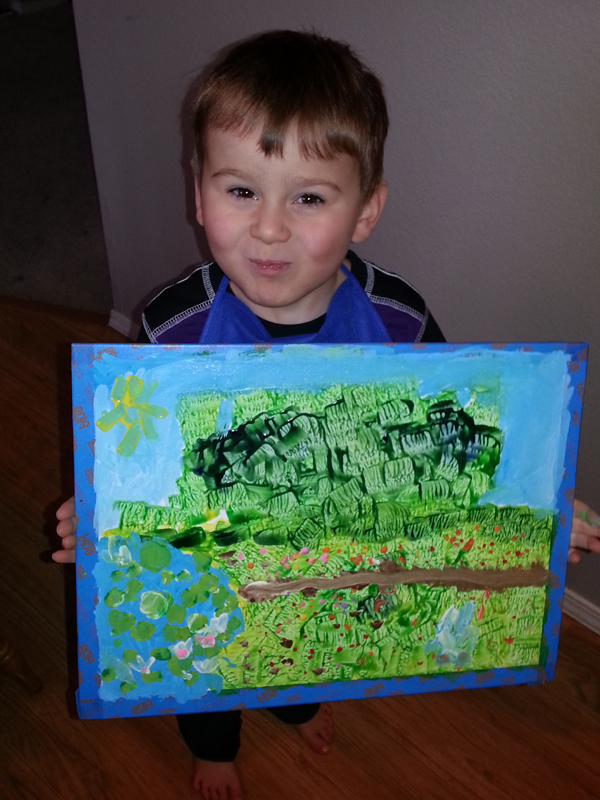 We had a jolly good time and really experienced impressionism. 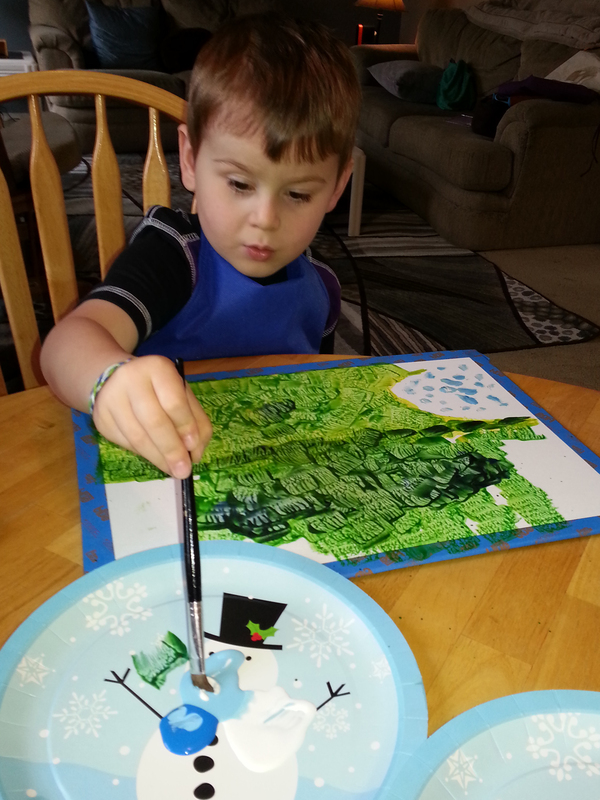 Mr. Picasso has a full step-by-step on his blog with lots of pictures. You can find a printable version at the bottom of this post. 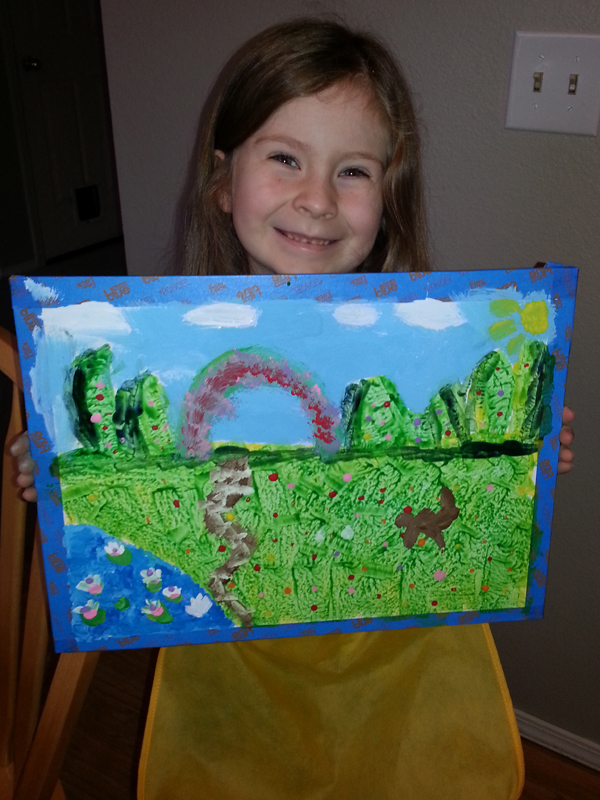 Here’s our afternoon of painting. 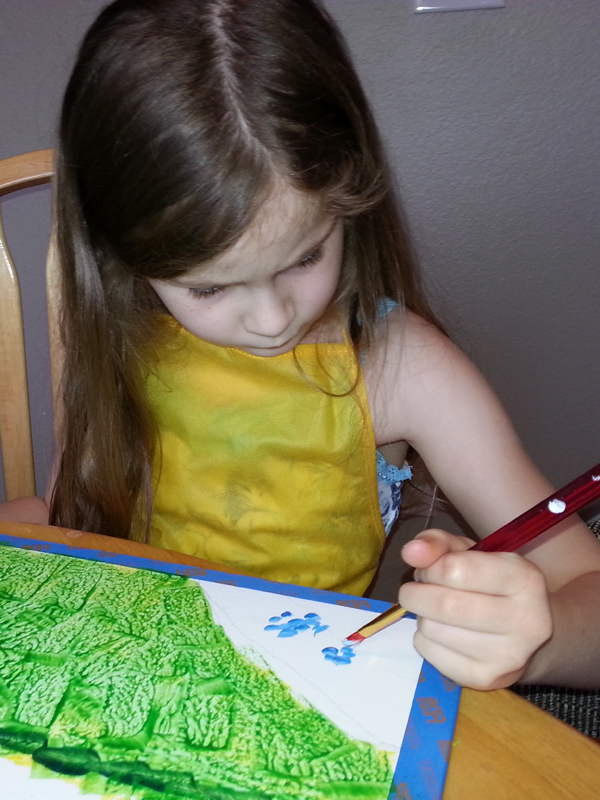 We began by taping off the edges of our canvas so we would have a nice clean edge. Then started with an outline in pencil of a pond and horizon. 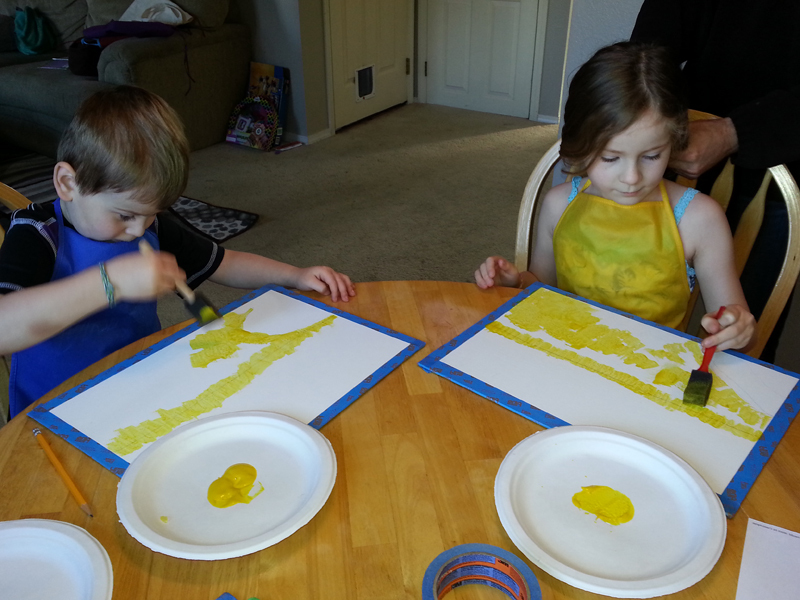 We tapped yellow paint with a sponge all over up to the horizon line. Left a blank spot for the pond. 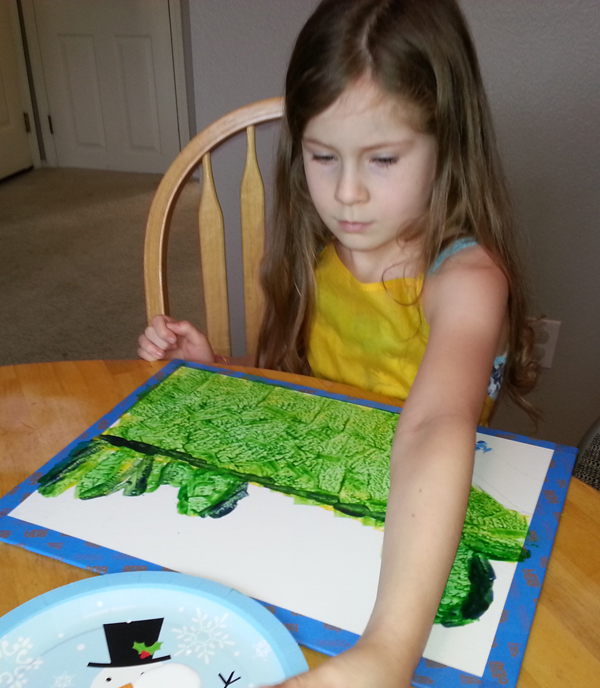 Then we covered it all up with green using the same method. Sponged in some bushes just above the horizon line and then added a shadow with blue along one edge and the horizon. Then we did the water. 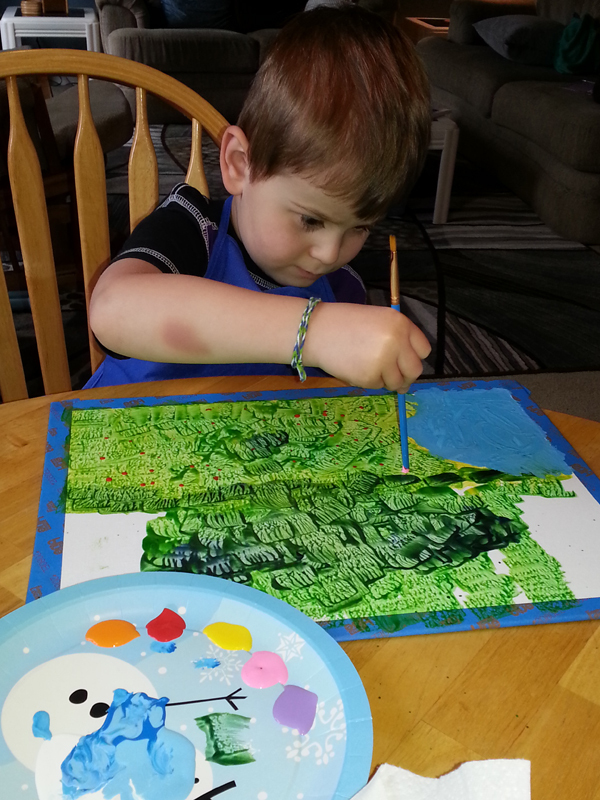 You can see that my little guy is dipping his brush into three colors at a time, being careful not to blend them all together. 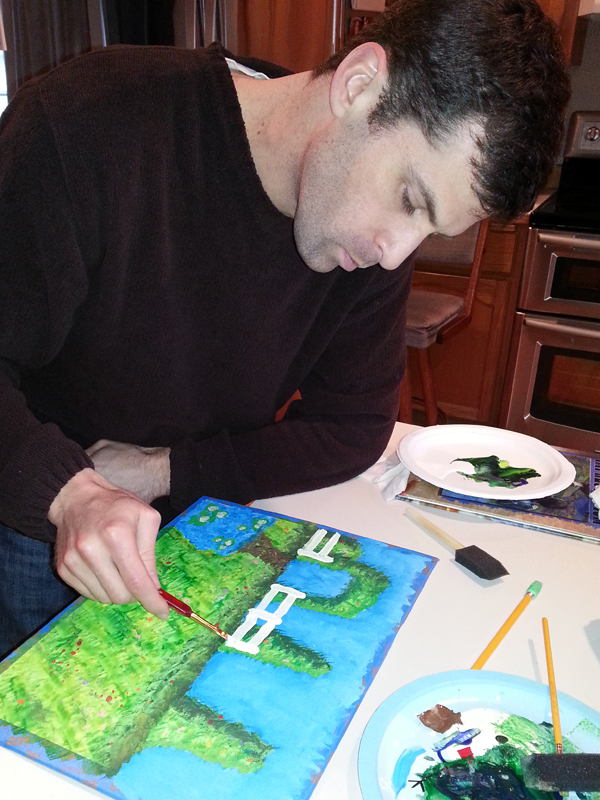 You can also see that his bushes are clearly kudzu and have taken over his imaginary world. When you swoop the paintbrush onto the pond area, the tri-color gives the appearance of dark and light water with light reflections. 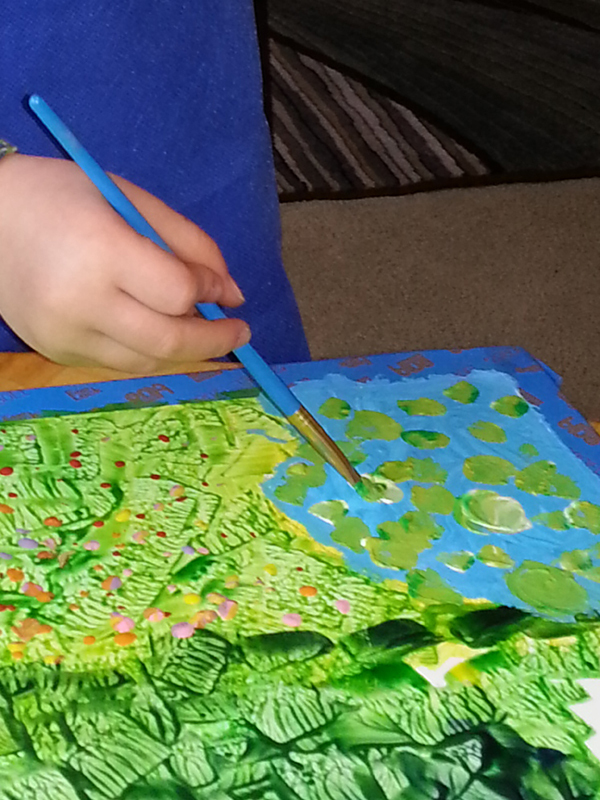 While the pond dries a little, you use the back side of your paintbrush to dot in some flowers. 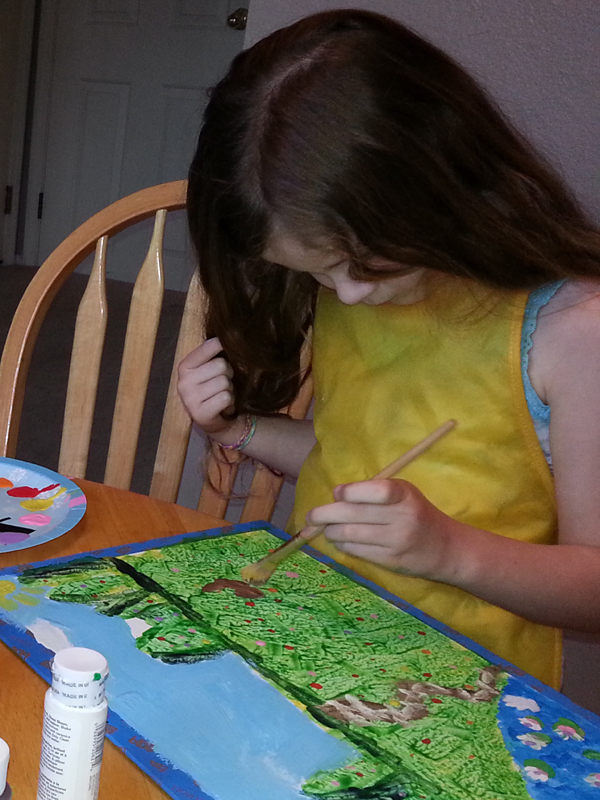 After the pond has dried a little, you do the swoosh thing with multiple colors of green for the lily pads. And white, pink and yellow for the flowers. There’s an excellent sketch of how to do this in the printable instructions. 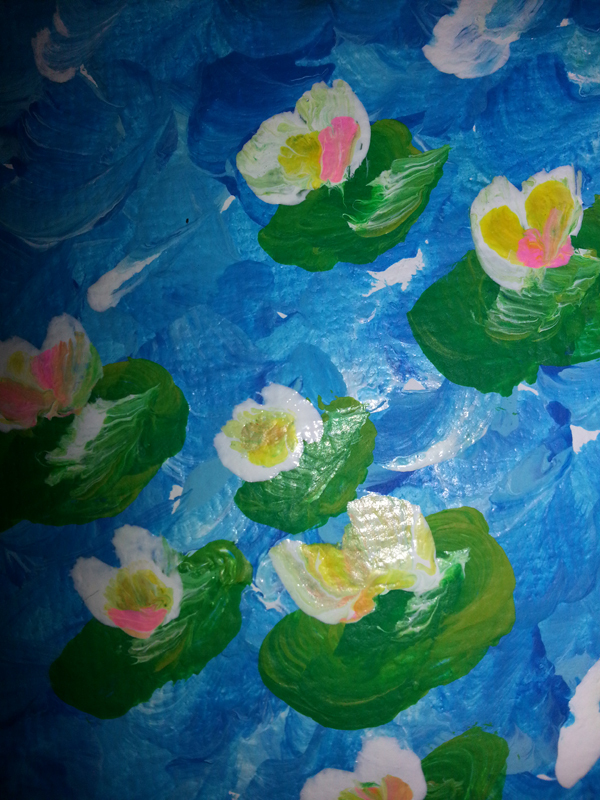 Here’s a close-up of the water, lily pads and flowers. You can see that the colors haven’t fully blended. About this point, we realized we hadn’t painted the sky — so we did that. Then sponged in some brown paths. 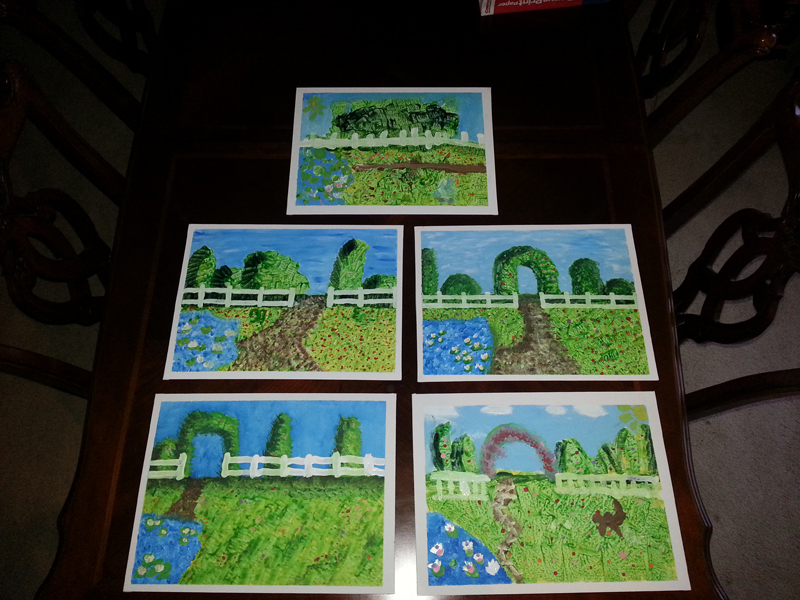 Once your painting has dried, it’s time to do the fence line. Again, detailed instructions in the printable. There are actually two different ways you can do this. One involves tape, the other is just a freehand paint job. How can I be mad? Look how happy she is. And the boy too. His bunny is the blue(ish) blob at the bottom right. He also decided to make his path a bee-line to the pond. Why waste time walking thru the garden? Full instructions from Mr. Picasso’s Art Room here.